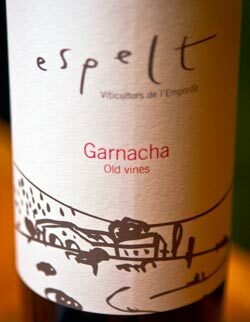 Such was the case with Espelt’s “Garnacha Old Vines” when seeing it in San Francisco last year at K&L Wines. We have tried all of Espelt’s wines on various occasions, both at home and at their winery between Vilajuïga and Roses in the DO Empordà appellation. But, we’d never encountered this and it was simply for the reason that this wine is only available in the export market, so you’d never see it at its home in Catalonia. Grown from 80 year-old vineyards up in the foothills on granitic soil, we were quite interested to try it, especially after Jancis Robinson had kind words for it earlier this year on the Financial Times. Thankfully, we met up with owner and winemaker Anna Espelt about two weeks ago and when we inquired about it she graciously “lent” us a bottle to taste.